Like any other electrical motor asynchronous motor also have two main parts namely rotor and stator. Stator: As its name indicates stator is a stationary part of induction motor. A single phase ac supply is given to the stator of Single phase induction motor. Rotor: The rotor is a rotating part of induction motor. The rotor is connected to the mechanical load through the shaft. The rotor in single phase induction motor is of squirrel cage rotor type. except there are two dissimilarity in the winding part of the Single phase induction motor. Squirrel cage three phase induction motor. The rotor is cylindrical in shape and has slots all over its periphery. The slots are not made parallel to each other but are bit skewed as the skewing prevents magnetic locking of stator and rotor teeth and makes the working of motor more smooth and quieter. The squirrel cage rotor consists of aluminium, brass or copper bars. These aluminium or copper bars are called rotor conductors and are placed in the slots on the periphery of the rotor. The rotor conductors are permanently shorted by the copper or aluminium rings called the end rings. In order to provide mechanical strength these rotor conductor are braced to the end ring and hence form a complete closed circuit resembling like a cage and hence got its name as ‘squirrel cage induction motor”. As the bars are permanently shorted by end rings, the rotor resistance is very small and it is not possible to add external resistance as the bars are permanently shorted. The absence of slip ring and brushes make the construction of single phase induction motor very simple and robust. When single phase ac supply is given to the stator winding of single phase induction motor, the alternating current starts flowing through the stator or main winding. This alternating current produces an alternating flux called main flux. This main flux also links with the rotor conductors and hence cut the rotor conductors. According to the Faraday’s law of electromagnetic induction, emf gets induced in the rotor. As the rotor circuit is closed one so, the current starts flowing in the rotor. 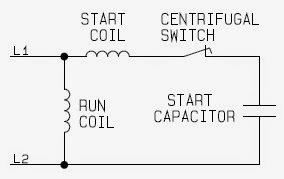 This current is called the rotor current. This rotor current produces its own flux called rotor flux. Since this flux is produced due to induction principle so, the motor working on this principle got its name as induction motor. Now there are two fluxes one is main flux and another is called rotor flux. These two fluxes produce the desired torque which is required by the motor to rotate. Why Single Phase Induction Motor is not self starting? Each of these components rotates in opposite direction i. e if one φ m / 2 is rotating in clockwise direction then the other φ m / 2 rotates in anticlockwise direction. When a single phase ac supply is given to the stator winding of single phase induction motor, it produces its flux of magnitude, φ m . According to the double field revolving theory, this alternating flux, φ m is divided into two components of magnitude φ m /2. Each of these components will rotate in opposite direction, with the synchronous speed, N s . Let us call these two components of flux as forward component of flux, φ f and backward component of flux, φ b . The resultant of these two component of flux at any instant of time, gives the value of instantaneous stator flux at that particular instant. Now at starting, both the forward and backward components of flux are exactly opposite to each other. Also both of these components of flux are equal in magnitude. So, they cancel each other and hence the net torque experienced by the rotor at starting is zero. So, the single phase induction motors are not self starting motors.